The problem with the pursuit of perfection is that it over looks the steps it took to get there when based on a cumulative scale. By that I mean that a project that brings you back to your origins while showcasing the skills that have been put to use since then has a whole different sense of gratification. N64p’s are losing to both practicality and cost reasons on any selling level, but the sheer fact that they can be built just for the sake of it and still get better as time goes on is a very meaningful continuation of an old idea that was so popular just a few years ago. Anyway, now that the philosophic portion is out of the way, I made a great deal of progress on a N64p Commission I’ve been working on for the past couple of months. With the design process complete, the time came to finally start with the assembly portion of the project. 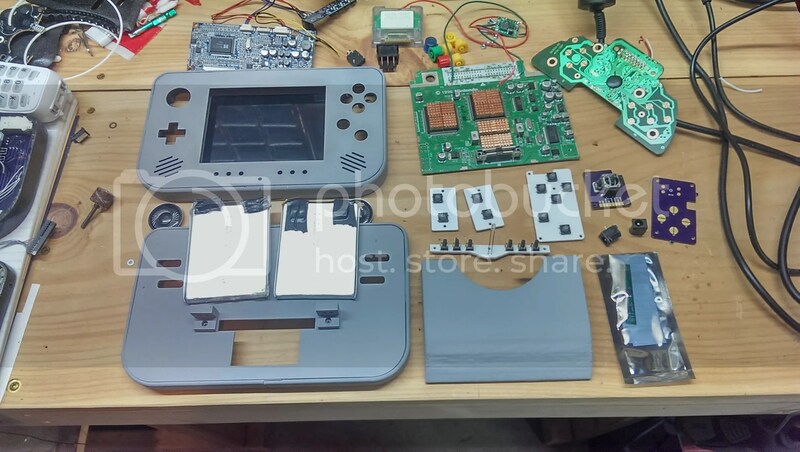 This is an old school mod all they way, but does have a few of the benefits like 3D printing and CNC machining in it’s corner to make this one of the finer designed N64 portables I’ve made. In any case, just wanted to share a project update aside from the OUYAp V2. These simpler projects are much needed from time to time to remind me that the “hobby” aspect is what I fell in love with long ago and what keeps me going with it, even if it seems a bit obsessive sometimes.